You will have to be patient with me and my (developing) photographing skills…this photo does not do this dish justice. Ever since cutting dairy out of my diet, I crave creamy pasta. I’ve always loved pasta and going dairy and gluten free has been easy once I found a pasta that makes me feel like I’m eating the pasta I used to eat. In addition to finding a good gluten free pasta, I’ve research ways to replicate a cream sauce minus the dairy. Avocados not only give a great creamy consistency, but they are so mild in flavor that they can manipulate so many things! Pesto is so full of flavor that the bland avocado is suddenly awakened with an abundance of flavor that is great on anything…especially chicken and pasta. Instead of eating flour pasta with a heavy dairy cheese sauce, give this avocado cream sauce a try. It even stores nicely in the freezer if you want to make extra. 1. If you need to make the pesto, do so first. Once you have the basic pesto made, add the avocado to the food processor or bender. Slowly add the coconut milk. Once the pesto is complete, add the juice from ½ a lime. Set aside. 2. Cook pasta as directed and set aside. 3. In a large skillet, cook chicken breast in coconut oil until cooked, about 10 minutes. Season chicken with salt and pepper, remove from skillet. 4. In the same skillet used to cook the chicken. Add the pesto and heat on medium until bubbly, stirring constantly. 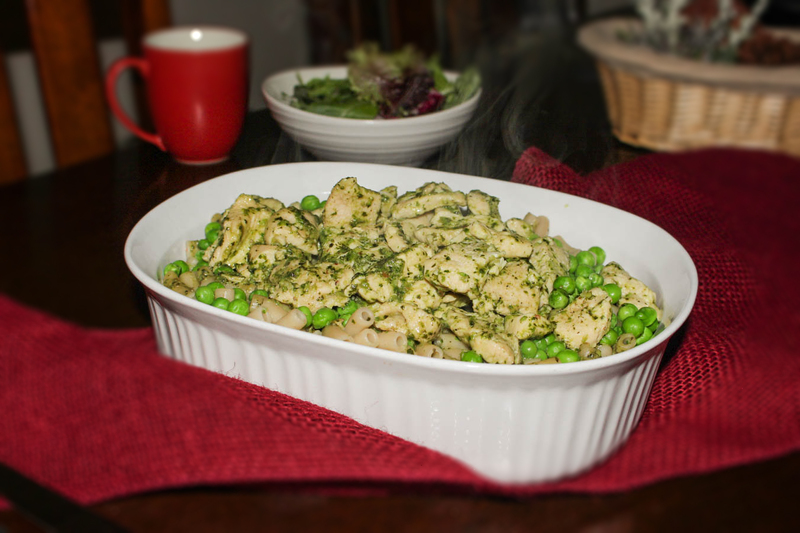 Add the chicken and peas to the skillet, stirring gently. Turn the heat off and add the pasta. 5. Top with fresh basil and enjoy! 1. Place all ingredients into a food processor except olive oil until well combined. 2. Slowly add olive oil to combine.